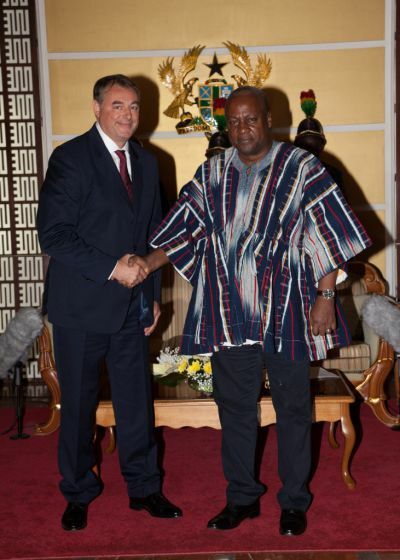 Accra, September 17th, 2015 -- The newly appointed Ambassador of France to Ghana, H.E François Pujolas, presented his letter of credence to President Mahama at the Flagstaff house, on the 17th of September, 2015. H.E François Pujolas expressed the hope that the relation between Ghana and France “will continue to grow” at all levels. He said that his mission will be to consolidate all the initiatives that have been taken in the past few years, and also to implement concrete and innovative solutions to further develop the partnership between Ghana and France. Ahead of the COP21, the UN conference on climate change in Paris in December, he also declared appreciating Ghana’s commitment towards the issue of climate change, and President Mahama’s decision to attend the opening segment of the conference.